Classic 243 slot is very definitely what the title suggests, a 243-way slot of 'classic' design. 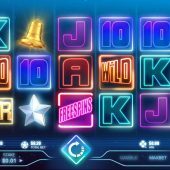 The symbols are of a neon retro style in the manner of Netent's Neon Staxx or Thunderkick's Arcader games and likewise the sounds hark back to those of the 1980's video games, with bleeps and other basic electronic effects providing the soundtrack to the reels. Rabcat's games are known to be of very low volatility, for example their Castle Builder game also available via Microgaming's Quickfire platform, so will Classic 243 be any different? As with all 243-way slots, we begin with 5 reels of 3 rows in which any 3 or more consecutive symbols from left-to-right provide a win. The symbols are all single with no stacked icons and we begin with the standard card values. The lowest pay is for 5-of-a-kind 10's which offer a mere 0.5x bet and we have to get to Kings to hit 1x bet and then Aces at 2.5. There are single Wilds on all reels which don't multiply and these offer 50x stake for the 5 as do the Bells. Diamonds next offer 25x and we see more traditional icons of Bars, 7's and Stars with lower multiples. One thing to observe is that the Wilds are positioned so you only see them on the reel with lower card values and not the 'picture' symbols, same as in Thunderstruck 2. This means the best potential base game hit would be 50x for 5 Wilds along with a few other small card value hits on top; around 75x would be the outcome even for the best possible spin. 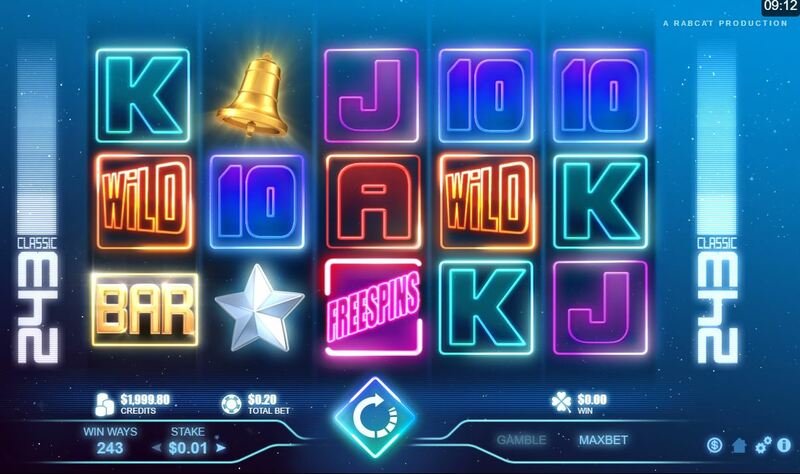 The only symbol not yet mentioned is the pink 'Free Spins icon. You can get 3 or more of these anywhere in view to trigger the game's bonus round which consists of 10 free spins which can be retriggered. Annoyingly these have no pay value but simply act as a trigger. So, do we get more potential with any bonus spin enhancements? Just about - on every free game you are guaranteed to get 1 reel land with either a 2 or 3-row stacked Wild. The single Wilds still appear on the other reels so a 'perfect' spin of a full stacked Wild on one reel with singles on the rest would yield a pay of 150-200x your bet. Triple that and you may even get to Starburst slot's maximum pay!